I hope everyone had a Merry Christmas! This year I received a few presents from my family: a rhinestone bow necklace, and a rhinestone bow bracelet, and a cardigan. But my greatest gift came from my fiancé. 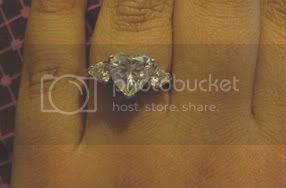 He gave me a second engagement ring! I'm so happy! 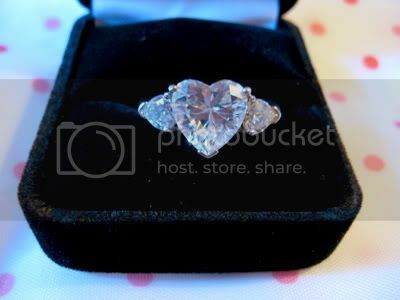 My first engagement ring was a plain claddagh. I love both of my rings though. I think I might wear my claddagh ring on a necklace. It's a very beautiful ring! Cute! Oh wow that is pretty and full of bling :D Congrats! Princess Sanyu, ♥-Qamarel-♥, and Violet LeBeaux Thank you so much. It is indeed very beautiful and bling-worthy. Thank you so much Ichigo! I'm sure there are some rings that would look wonderful on you. You should try going to a jeweler they could help you find a nice style. Thank you for visiting Engagement Rings!